The surfing decade of the 1930s ended with the United States entry into World War II, following the Japanese bombing of Pearl Harbor on December 7, 1941. The war was already well underway, having begun in Europe in September 1939. The Japanese and Chinese had been at war even before then. World War II was a global war that more or less lasted from 1939 to 1945. It involved most of the world’s nations, including all the great powers of the time that subsequently formed two opposing military alliances known as the Allies and the Axis. The Second World War was the most widespread war in human history, with more than 100 million people serving in military units. In a state of “total war,” the major participants placed their entire economic, industrial, and scientific capabilities at the service of the war effort, erasing the distinction between civilian and military resources. Marked by significant events involving the mass death of civilians, including the Holocaust and the only use of nuclear weapons in warfare, it resulted in 50 million to over 70 million fatalities. These deaths make World War II by far the deadliest conflict in all of human history. The Empire of Japan aimed to dominate East Asia and was already at war with the Republic of China by 1937. The world war is generally considered, however, to have begun in September 1939 with the invasion of Poland by Germany and subsequent declarations of war on Germany by France and Britain. From late 1939 to early 1941, in a series of campaigns and treaties, Germany formed the Axis alliance with Italy, conquering or subduing much of continental Europe. In the early stages of WWII, Germany and the Soviet Union partitioned and annexed territories between themselves of their European neighbors, including Poland. At this point, the United Kingdom, with its empire and Commonwealth, remained the only major Allied force continuing the fight against the Axis, with battles taking place in North Africa as well as the long-running Battle of the Atlantic. In June 1941, the European Axis launched an invasion of the Soviet Union, giving a start to the largest land theatre of war in history, which tied down the major part of the Axis’ military forces for the rest of the war. In December 1941, Japan joined the Axis and attacked the United States and European territories in the Pacific Ocean, quickly conquering much of the West Pacific. “In 1940, going into ‘41,” Palos Verdes Surfing Club member and San Onofre regular E.J. Oshier back-storied, “it more and more looked like there’d be a war.” War was already underway in Europe and in Asia. “There was a couple of guys from Oakland that had started surfing, that I could go down with. They never got very good, but they were very good friends of mine. They decided they were going to enlist in the National Guard. At that time, you serve a year in the National Guard and you could get out and you’d served your time, right? Except it wasn’t right (laughs). I thought, that’s a good idea. I’ll get in with one night a week with the National Guard. So, I did that and everything was going fine until December 7, 1941,” the Japanese bombing of Pearl Harbor, outside of Honolulu, Oahu. “That day… was a beautiful day at Santa Cruz,” E.J. remembered. “I was out at the Rivermouth, where the San Lorenzo River empties out. There’s pictures of me in Doc Ball’s book taken at the Rivermouth.” Back in those days, the Rivermouth could get really good. “Oh, it was phenomenal!” praised E.J. “It was absolutely machine waves. In the winter, a big sand bar would build up off the San Lorenzo River, you know, sort of a narrow triangle and the waves would hit the peak of that triangle, out there at a good distance offshore and start to build. The shoulders would just taper off magnificently, like they were right out of a machine. There’d usually be a set of 3 or 4 waves, then a lull. You absolutely couldn’t go wrong. “Yesterday, December 7, 1941 - a date which will live in infamy - the United States of America was suddenly and deliberately attacked by naval and air forces of the Empire of Japan. Japan has, therefore, undertaken a surprise offensive extending throughout the Pacific area. The facts of yesterday speak for themselves. The people of the United States have already formed their opinions and well understand the implications to the very life and safety of our nation. As Commander-in-Chief of the Army and Navy, I have directed that all measures be taken for our defense. Concertina wire strung along Waikiki beach and other beaches of Hawai’i and California symbolized the shutdown surfing suffered during the ensuing war years. Since surfing was considered impractical and self-indulgent and most surfers were in the armed services -- mostly the Navy -- no surf contests were held during the war years of 1941-1945. In one of the stranger chapters of surfing’s history, it was toward the end of the Second World War that surfboards were seriously considered for use as an instrument to advance military objectives. After the United States Marines suffered over 50% casualties in the taking of Iwo Jima in the summer of 1945, the Navy brought several Naval Combat Demolition (NCD) teams to Camp Pendleton to learn how to use surfboards. It has been suggested that the Navy was, in part, inspired by Gene “Tarzan” Smith’s paddling between the Hawaiian Islands on his paddleboard, unassisted. In late summer 1945, the NCD teams were “ready to paddle to war.” However, the atomic bomb drop on Hiroshima on August 6th and on Nagasaki three days later preempted the need of the Warboards and they were never used operationally. A more lasting war technology that was to effect surfing profoundly was the development of the neoprene wetsuit. According to Bev Morgan, the neoprene wetsuit was invented by Hugh Bradner for use by Underwater Demolition Teams during World War II. 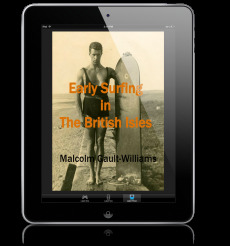 Gault-Williams, LEGENDARY SURFERS, Volume 3: The 1930s. Lueras, Leonard. 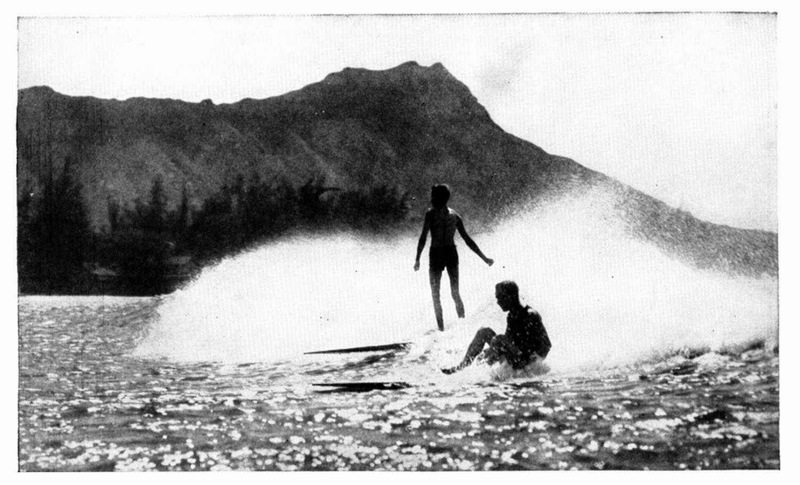 Surfing, The Ultimate Pleasure, designed by Fred Bechlen. Workman Publishing, New York, ©1984, p. 109. Solberg, Curtis B. and Morris, David W. A People’s Heritage, ©1974, John Wiley & Sons, p. 179. 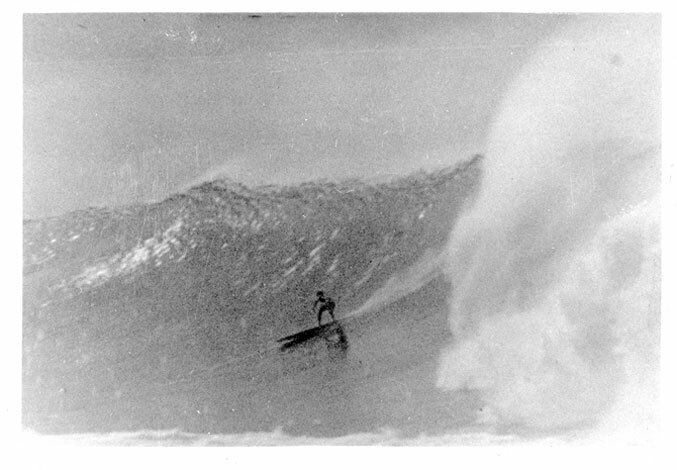 James, Don, Surfing San Onofre to Point Dume, 1936-1942, ©1996, p. 16. Lueras, 1984, p. 109 and 111. Gault-Williams, Malcolm. “Legends of the Hot Curl.” Fran Heath quoted. Kooperman, Larry. “Wave Warriors of the Navy,” The Surfer’s Journal, Volume 1, Number 2, Summer 1992. The Surfer’s Journal, “Undercurrents,” Volume 1, Number 3, 1992, p. 125.